Here’s one example of how the best stuff that appears on screen can have nothing to do with what’s in your screenplay… and why that’s great. Filmmaking is a collaborative artform. New screenwriters hear that truth often, but until you’ve spent time on set watching the process, you don’t get it. You really don’t. Newbie screenwriters are convinced that it’s their job to provide every parenthetical direction (mad) (happy) (confused) and every stage direction (he points, he smiles, he nods) the story needs. And that’s fine (to a degree)… you have to paint a picture for the reader, or it’ll never get to production. But the mistake is in believing that the screenplay will remain the blueprint for the director and the crew to faithfully reproduce the vision the writer had in their head. That it’s your unique vision, the movie you see in your writer’s brain, down to every sadly happy pointing nod, that everyone is dedicated to creating. Those naive young screenwriters are incredulous, if not offended, when they’re told that their screenplay will be changed, edited, enhanced, and improved by everyone from the director to the lighting guy in ways they can’t even imagine… and over which they will have no control. In reality, something magic happens on set … it’s an intense group enterprise driven by a motley crew of creatives and journeymen, who are under the gun of insane deadlines, unpredictable circumstance, weather and egos. They all want to put their creative mark on the project, and they all want to do their best work. They all contribute to the quality of the story, to the characters, and to creating special moments on screen that were never imagined by the writer. This is one of my prouder moments from my work on set. 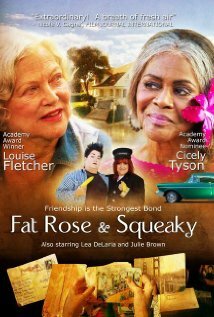 I worked as art director on the film Fat Rose and Squeaky, and there was a scene where Bonnie (Louise Fletcher) takes off with her two troublemaker buddies in her classic ’57 Chevy. The script said that the three women got in the car, where Bonnie opened the glove box, and retrieved a pack of cigarettes. I learned from my mentor Brian Sharp that when breaking down the scene as art director, it’s my job to think beyond the literal script and give the director, and the actors, choices. So when I got to this scene, I had to imagine “what else would be in the glove box of an 80 year old woman’s car?” See, if she opens the glove box and the only thing in there is — conveniently — the cigarettes the scene calls for, they’re obviously a prop. So I got a pack of cigarettes. A cool vintage Zippo lighter and matchbooks. A poorly folded map. Black Jack gum. A couple of those little travel sized packages of Kleenex. Hard candies. Ladies driving gloves. And five pairs of old classic sunglasses. When the actors (Louise, Lea DeLaria, and Julie Brown) ran a rehearsal, they found all those funky sunglasses, and started riffing with each other, trying on the different pairs. It quickly developed into a “bit”, where they simultaneously donned the glasses and struck a pose. The director loved it, and once it was shot and set to music, it became a “trailer moment”. That was magic. And it wasn’t on the page. It happened because everyone contributed to the creative alchemy of filmmaking. The art department thought beyond the page, and provided the director and actors with fun choices. The actors did what they do best, and imagined what their quirky characters could do with those choices. The director recognized the actors’ genius, and gave them the room to do their thing. And the editor and composer folded it all into the finished product in a way that created a “moment” that defined the characters, added humor, and frankly helped sell the film. Being on set is invaluable for understanding what it takes to get from page to screen. As a screenwriter, I worry less now about the choice of just the right prose nuance, and focus instead on making the story flow, and creating characters and moments that are ripe for others to capitalize on. And I find myself able to let go of the minutiae of blocking, and stage direction, and parentheticals, and trust in the director and actors to make the right choices, choices I might not even consider, to bring the scene to life. I’ve watched dialogue get rewritten on set, the finale of a film get rewritten during lunch break, entire scenes cut for lack of time, characters cut for lack of space on set, and all kinds of new funny, drama, or scary added by improvisation. If you’re a screenwriter, and you haven’t spent time on a working set, find a way. Not in the capacity of screenwriter… I promise you there are student and indie productions in your neighborhood that would love an extra pair of hands to carry heavy things, fetch coffee, or distribute sides. While you’re there, observe. Learn. Get a look at the script, and watch how it evolves. You’ll have a greater appreciation for all the work that goes into making movies after the screenplay is done. I got involved in production to understand the process, so I could do a better job as a screenwriter giving everyone what they need (here’s a kind of overview of that story). Since then I’ve worked on 11 features, 9 shorts, and 2 TV series in some capacity, as a writer, director, producer, art director, prop builder, or storyboard artist. I’ve had a chance to observe micro-budget and multi-million dollar projects (all at the indie level — admittedly no studio projects). And I love what happens on set. BTW, if you’re a writer-director, you may have more control over translating your screenplay to the screen. If your screenplay is your personal magnum opus, and you’ll die a sad hollow death if it isn’t faithfully reproduced, then produce and direct it yourself. And more power to you. Great stuff Chip. May I share it on my site: CastingExchange.com? I think our fans will find this very insightful. Ryan – let me know what you mean… do you want to link to it, or reprint it on your site in its entirety? LMK … either will work but differently.